• Prevents and reduces the occurrence of acute asthmatic attacks and need for puffs. 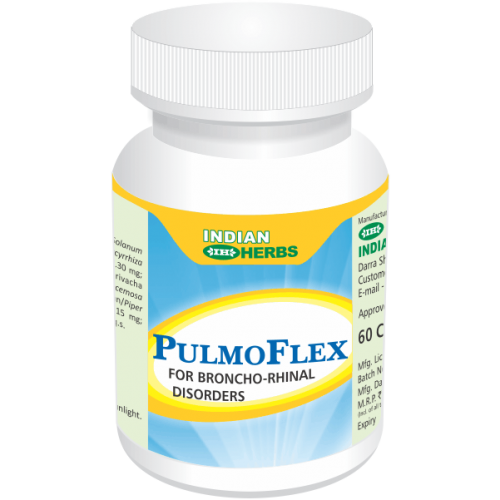 Herbal PulmoFlex® is scientifically developed as a basic remedy for treatment of allergic rhinitis and asthma. PulmoFlex® as immune-modulator, tackling the root cause, decreases the raised serum IgE level and number of eosinophils in nasal and bronchial secretions and peripheral blood. PulmoFlex® inhibits the biosynthesis of leukotrienes and other inflammatory mediators and PAF mediated allergic and inflammatory responses. PulmoFlex® also acts as Anti-allergic, Bronchodilator, Mucolytic, Expectorant, Tussis-modulator and Decongestant. PulmoFlex® improves static and dynamic lung volumes and lung function. It is also suitable for asthmatics with diabetes and hypertension. PulmoFlex® improves the quality of life in asthmatics. It is a comprehensive therapy of choice for allergic rhinitis or hay fever. PulmoFlex® is compatible with oral and inhaled anti-inflammatory drugs and bronchodilators hence they can be used together, in acute conditions. For treatment and prevention of Allergic Rhinitis and Hay Fever including perennial cases. Chronic asthma in children and young adults obviating the need of corticosteroids. Asthma complicated by diabetes and hypertension. Pulse Therapy with corticosteroids and then sparing their use after a short course. Longer episode free intervals and for prevention of recurrent acute attacks. Prevention from side effects of corticosteroids, beta-adrenergics, anti-histaminics and their later complications.